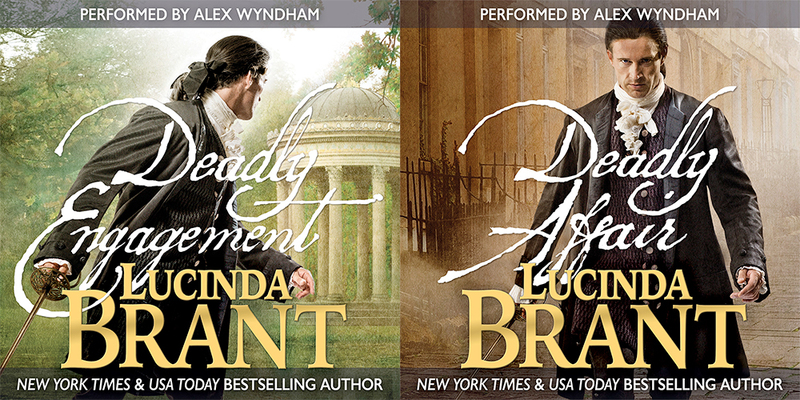 My guest today is Lucinda Brant who is here to discuss one of my favourite topics... gadding about all over! The winner of the Deadly Peril giveaway is Growlycub; congratulations! 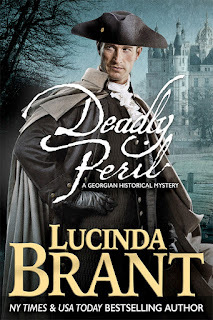 In Deadly Peril: A Georgian historical mystery (Alec Halsey Series Book 3) I send my hero to the Continent. Alec, Lord Halsey is on a rescue mission to save his best friends who have been locked up in a forbidding fortress-castle by a mad Margrave. Castle Herzfeld is located in Midanich, a margravate of Lower Saxony sandwiched between Holland and the Kingdom of Denmark, and bordered in the south by the several German states, one of which is Hanover (ruled from afar by King George the Third). Midanich is a fictional margravate of the Holy Roman Empire whose political boundaries encompass a geographical region known as East Frisia. 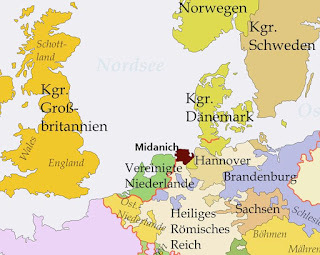 To give Midanich a solid basis in fact, I researched everything I could about East Frisia: The flora and fauna, terrain, weather, history, towns (the names of which I kept), industry and agriculture, and the transportation networks now and then. And because I was unable to travel to the region and study it first hand, I took several drone tours from the comfort of my study (you’d be surprised what’s out there on the internet!). I studied maps, from the 16th century right through to the present Google maps, and read personal travel blogs about hiking, biking and barging through the area. And then there’s the 18th Century resources. The fabulously detailed traveler’s guide The Grand Tour (in four vols) by the well-traveled Georgian Thomas Nugent. Published in 1749, it is the equivalent of an 18th Century Lonely Planet Guide to Europe. Within its pages is everything the Grand tourist needs to know about towns and regions abroad. Nugent provides information on local history, food, transportation—even the timetables for public coaches and barges, and the costs incurred for these trips. He offers advice on selected routes, and which inns to stay at and which to avoid. And yes, Mr. Nugent visited East Frisia, providing this historian’s hero and his pals much needed local Intel. I also consulted Boswell’s diaries of his time in Holland in 1763/64 (which happily coincide with Alec’s dash abroad) because East Frisia was at one time ruled by the Dutch, the main port Emden providing a haven from persecution for Dutch Calvinist merchants who fled the Spanish invasion of Holland in the 17th Century. Emden remained a Dutch-speaking enclave, and Boswell’s dairies provided insight into the Dutch and their customs, and from the perspective of a foreigner living abroad. Boswell also discusses the various ports and the customs duties imposed on travelers, and what to look out for and how to overcome the officials who search every bag and boat looking for contraband. Boswell’s journey to Holland began by coach from London to Harwich, and from Harwich he took a packet boat (so named because these ships delivered mail to and from the Continent) for Helvoetsluys. But our hero needs to travel to Midanich, which is further north. What adds to his difficulties is that the margravate is in the midst of a civil war, so it is not only a difficult place to get to, it is a dangerous place to be. Compounding this is the time of year. It is November and the winter weather is closing in. This being the eighteenth century, there are no planes, trains or automobiles! Travel time is not counted in hours, but in days and mostly in weeks, and was very much dependent on the weather. For ships to be able to sail, there had to be favorable wind conditions. 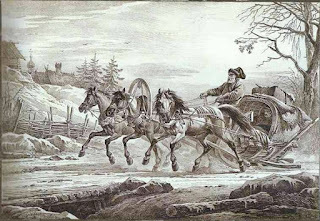 For carriages to make their destination, roads that were little more than muddied tracks—though the road between London and Harwich was well maintained—had to remain dry and free of ruts. Rain and snow meant mud and slush and bogged carriages, which often led a broken axle, and added days to a journey. As Alec is in England, he must take a sea crossing to the Continent. To do this he travels by carriage to Harwich. Packet boats sailed twice a week, on Wednesdays and Thursdays. Fortunately for Alec he does not need to wait for the appropriate sailing day or travel to a predetermined destination because he has the use of a private schooner. 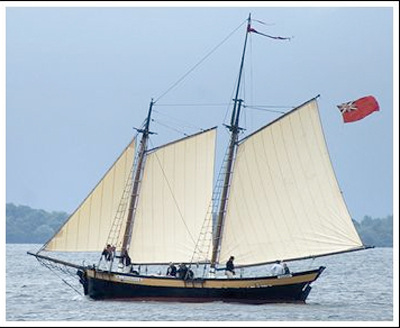 Schooners were much faster under sail than the packet boats and were not constrained by particular sailing routes. Yet, the sea journey is not without its hazards, and not all are weather related. Privateers and pirates patrol the North Sea, and as the schooner nears the chain of islands off the coast of Midanich it is boarded by pirates under the employ of the Margrave to confiscate the cargo of any ship that comes within the country’s territorial waters. The schooner is forced to dock at the port city of Emden, which further delays Alec’s journey. As an essentially Dutch town, Emden is crisscrossed by canals, and had over thirty bridges. And like the canal network in Holland—which connected most towns and was a staggering 425 miles (685 kms) long and employed 364 treckshuiten—the main form of transport in Emden is by barge—treckshuit. 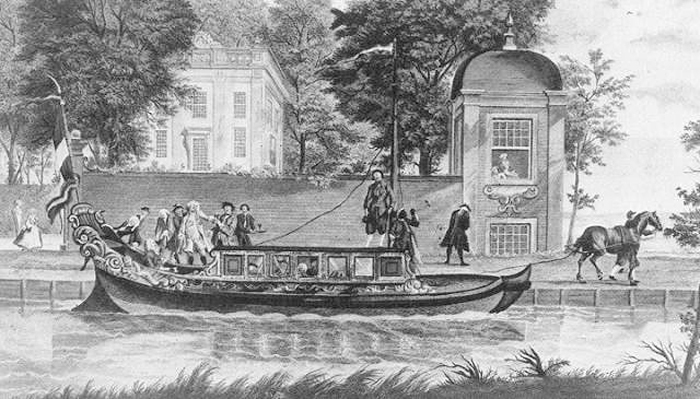 Treckshuiten were essentially water taxis and ran to strict timetables and set fares. They are slowly pulled along canals by horses led along a towpath by a jager. 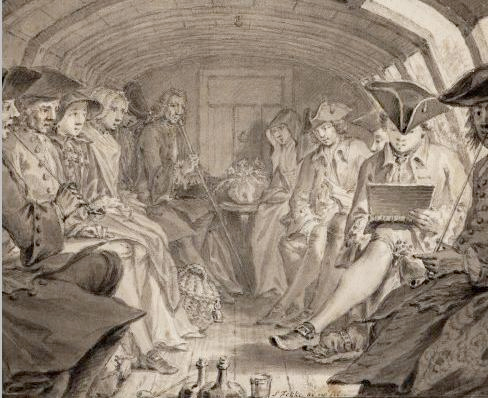 As public conveyances treckshuiten were sparsely fitted out, with benches running under the row of windows and sometimes with a table between these that allowed passengers to sit and play at cards and board games, drink their tea and read to pass the time. Wealthy merchants owned private treckshuiten, more elaborately decorated and fitted out. A canal was built between Emden and the nearest large town Aurich, a distance of some 14 miles, completed in 1798. But for the purposes of my fictitious margravate, I provided Midanich with this canal years earlier. Travel by treckshuit is the most efficient means of transportation for a region dominated by marshland and peat bogs. Icy winds blow off the North Sea, and the land is so flat, with eighty percent swampy grassland, local folk lore has it that when the air is clear “You can already see on Wednesday who will come to visit next Sunday”. Alec and his party travel in a convoy of five treckshuiten and once outside the fortified walls of Emden they are protected from rebel attack by a company of the Margrave’s soldiers. With the canal terminating just outside the town of Aurich, Alec must use alternate transportation for the rest of his journey cross country, first to Wittmund, then south to Castle Herzfeld (Wilhelmshaven). The terrain remains barren, flat and swampy, no place for a carriage laden with passengers and luggage to travel paths that are little better than sheep runs in this part of the Continent. Thus, Alec and his party have brought along sledges to complete their journey to the eastern seaboard. Built along similar lines as the Russian troika which was capable of reaching speeds of 28-31 mph (45–50 kms) the sledges have an open-fronted light framed carriage attached to two smooth running boards, which glide over the icy hardened terrain. The sledge carries two passengers, who are rugged up under a bear skin, with a brass foot warmer at their feet, to ward off the chill from the freezing winds. A driver sits up front handling the two harnessed black Frisians—a horse breed indigenous to the area, and famed for its sturdiness, height (nothing under 15 hands) and majestic bearing. We leave our hero on the outskirts of Castle Herzfeld, having traveled from England to Midanich by schooner, 252 nautical miles; from Emden to Aurich by treckshuit, 14 miles (22kms); and then from Aurich to the east coast via sledge, a further 50 miles (80 kms). And having traveled by boat, barge and sledge Alec has finally arrived at a place of unspeakable memories from which he barely escaped and vowed never to return, ready to do whatever it takes to free his imprisoned friends. You can find out what happens to Alec and his companions in his latest adventure. 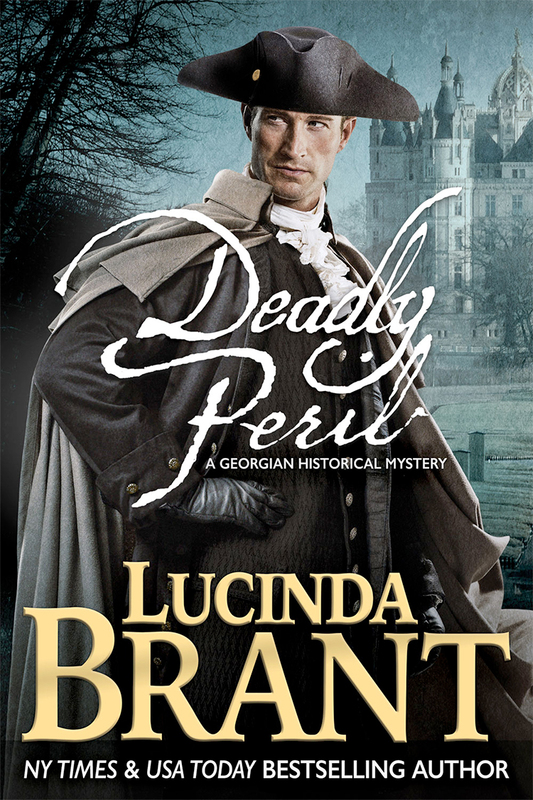 Deadly Peril: A Georgian Historical Mystery (Alec Halsey Book 3) which was released on November 7. 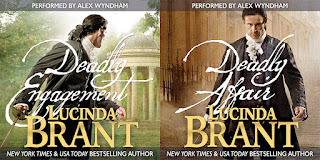 To celebrate its publication, those who leave a comment will go in the draw to win an ARC epub/mobi of Deadly Peril, and also have the chance to win one of four audiobooks of the first two in the series Deadly Engagement and Deadly Affair, performed by British actor Alex Wyndham. Written content of this post copyright © Lucinda Brant, 2015. Wow, what a fascinating post. Traveling would be an exhausting business and only the determined would make their destination. I was tired just reading about all the different methods of transport, and that would be just the start. There is all the logistics of food and accommodation as well. I enjoyed books 1 and 2 and would love them on audio. How did you pick the name of your principality? This is what I love about history- the details that make it possible to imagine life at the time and to understand events. It is also one of the things I love about the internet - the instant ability to benefit from the hours of research by someone else. Having listened to all of your other books available on audio, I am about to embark on the Alec Halsey series and look forward to it eagerly. Yes, it really gives you perspective on traveling then vs. traveling now. This may be a little off topic - but did you notice that many of these very places and countries are the same places and countries in Beowulf? Good work in any event! One of the things I love most about reading Historical romance novels is the fact that I learn some interesting historical facts I never knew before. If I don't know or understand about some little bit of history, I look it up and find out what I can. This article gives me a lot of sources to check out and read up about. Thank you. fascinating post! with the comment about marshes and so on, I was having pictures of a similar landscape to Erskine Childer's 'Riddle of the Sands' [an excellent and Buchanesque adventure filmed so adeptly with a very young Michael York as Carruthers and Jenny Agutter playing opposite him]. I love the treckshuiten! The differences between the harnesses of a troika and those of the English three-horse equipage of Unicorn are marked as Troika has three abreast, and Unicorn has two wheelers and a leader. I take my hat off to you for the amount of research you do for your books; I've read both the Roxton and the Salt Hendon series and they certainly convey the spirit of the times. I'm looking forward to reading the Alec Halsey books. Thank you also for including the details of your source materials; I've downloaded the 4 volumes of the Grand Tour for perusal later! Best wishes. Wow! What an enormous amount of research to make your characters take an authentic journey. I'm impressed - I haven't yet managed to master the intricacies of continental Europe in the 18th century!